You'll get a kick out of these. 2 Shirts, 1 low price! The first Dutch "football" team was formed back in 1879. Since then, the Dutch National Team ("Het Nederlands Elftal") has become one of the most enthusiastically watched national teams throughout FIFA's rich history. 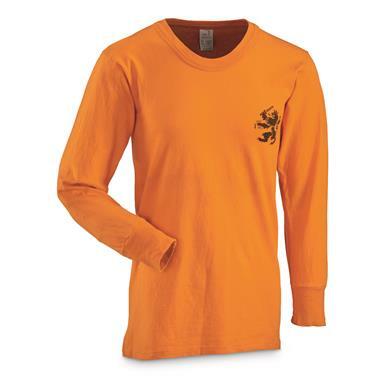 These Shirts are official Dutch National Team Shirts, manufactured for the Official Royal Dutch Football Association (KNVB). Blaze Orange is both the national color of the Netherlands, as well as a cool color to keep around for hunting season. Breathable, built for high activity, here for a surplus price!